Thanks to TFW2005 member Gaokaiser and the official social media channels for the Bumblebee movie’s March 22nd Japanese release, we now know who is joining the voice cast as a certain duo of Decepticons. 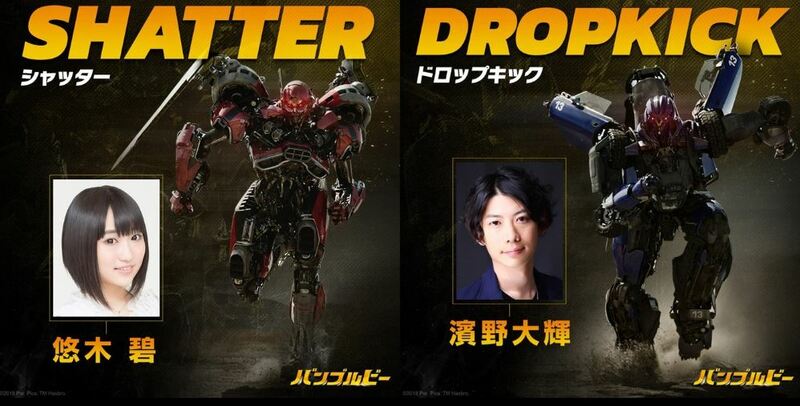 Actress and singer Yuki Aoi is aboard as Shatter with Hamano Daiki returning to the Transformers fold as Dropkick. Daiki’s resume includes previous voice cast turns as Sideswipe in Transformers Adventure and Slug in Transformers Power of the Primes. Read about the rest of the voice cast announced so far, then sound off on the 2005 boards! I just love her act, so this is a great news. No wonder her interview was on the 2019 edition of the Transformers Generation magazine. She's so good at playing villains such as Clementine in Overlord and etc. , so I'm looking forward to see how she's gonna play Shatter. What makes this great is that Aoi Yuki adores movie Bumblebee. So this is wonderful news for her to be a part of something she loves. Her range as a voice actress is also fantastic, so she's a great choice for someone like Shatter. Aoi Yuuki as Shatter? That\'s really cool! Wow, Shatter is voiced by Aoi Yuuki. I don\'t expect her to be voiced Shatter. I prefer a Veteran female Seiyuu like Mie Sonozaki. Huge fan of Ms. Yuki, really versatile actress. It'll hard to believe Shatter shares a voice with Madoka and Shuten.